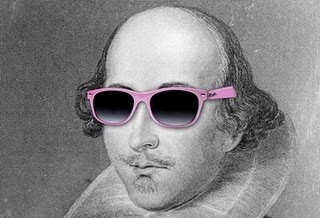 The Bard incognito… or how I imagine he would do it. Some believe The Rival Poet to be a wordsmith who challenged Shakespeare. Others propose the rival of the sonnets to be Shakespeare’s way of personifying the pressure of competition, brought about by a multitude of other exceptionally skilled writers in his midst. I believe in a slightly broader theory – that the point is not who it was about, but rather recognition of insecurity, burning ambition and admiration of rival talent within even the brightest of the bright. I think in certain ways he was talking about a voice from within pushing him to be better. It is widely rumoured that William Shakespeare was a nom de plume for a nobler gentleman. I personally believe this to be true. If you take a quick scattered look (yes, Google it, that’s good enough) it’s not difficult to find pieces of the man assumed to be The Bard. There are taxation records, warrants for arrest, recordings of court appearances, stories of financial woe and the like. This is not a slight on the man’s reputation, just a realistic representation of a common man. And that is exactly where my leaning towards the pseudonym theory solidifies. One glance at the collected works and it’s plain to see – these are not the works of a common man. Only years of convoluted history combined with prolific skill could create such a mystery. When you picture a man connected directly from heart to mind to quill and ink, who’d have thought there would be deeply hidden unspoken truths? The reason I mention The Rival Poet is firstly because the idea is clandestine and intriguing. I’m sucked in by it. Nobody knows for certain who Shakespeare wrote the sonnets in reference to. But do we really care? Probably not. It’s just cool to think about. My second reason is pretty personal. I feel insecure today and I need a reason to shake it off. This whole ‘Rival Poet’ deal hints at a very human side of Shakespeare – a challenge from a man to himself to be better than he was last night and better then he thought he could be this morning. A man who was irrefutably one of the very the best in history at what he did still found areas of weakness and disillusionment; struggled with self doubt. But you know what? He was and still is legendary. Lesson time: Insecurity may tell you a million vaguely logical reasons to be afraid of something, but you have one excellent reason to ignore them all – fear is shortsighted and for that exact reason it has no idea who you are capable of becoming in spite of it. Shakespeare knew fear, so he wrote some poems about it. Then he wrote Hamlet.